After World War II, there were some major fashion changes. 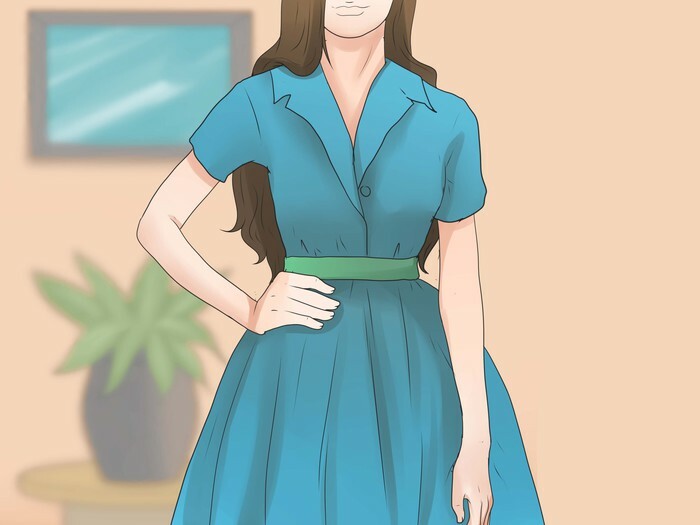 The 1940s silhouette had wide shoulders and a short skirt, but the 1950s styles were hourglass in shape (a fitted body with small shoulders, a small waistline, a full skirt and higher heels). Though the styles changed pretty drastically from the beginning of the decade to the end of the decade, there were quite a few fashion staples that were constant throughout. 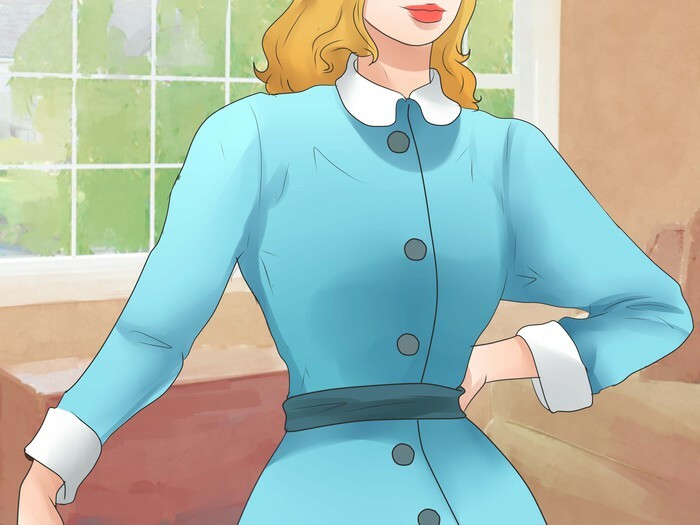 If you're interested in dressing in a '50s style, here are some things to consider. Find a fitted blouse. Quarter length sleeves were popular during this time period. The shoulders were fitted rather than puffy. However, sleeveless blouses were also popular. Small collars close to the neckline, called Peter Pan collars, were typically round in shape. Look for jackets that are very fitted, with more rounded shoulders. 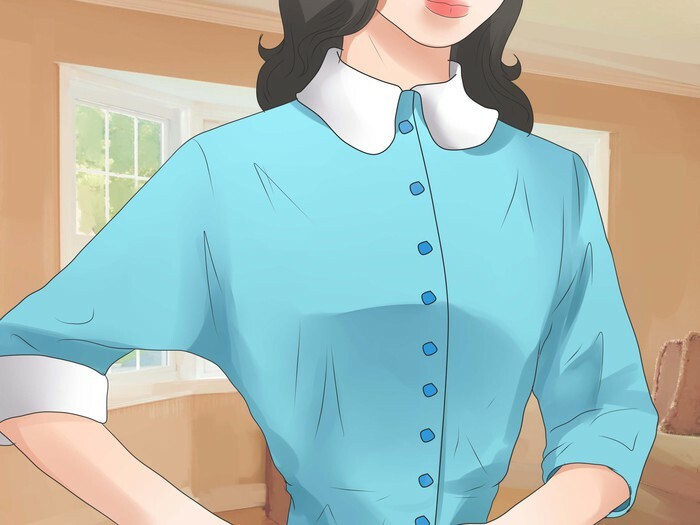 This type of clothing was hemmed at the hip level to emphasize a woman's small waist. Collars on jackets were often small and rounded in the Peter Pan style, just like on the blouses. There were many types of decorative pockets and big buttons on jackets in the 1950s. Full skirts. These had more fabric, often with layered petticoats to make it more full. The material could be sewn in many different ways including circle, gathered, pleated or gored. Swing skirts. These were knee high skirts that were also called poodle skirts. However, poodles were not the only animal featured on swing skirts. Nearly any animal, insect, or flower could be depicted on this kind of skirt. Try a shirt dress. Shirt dresses were very popular. These had a shirt-like bodice, with no gathered/exaggerated waistline. A narrow belt was often worn with this kind of dress. The A-line look (narrow shoulder to wide hem) was very popular. Looser fitting dresses were also seen mid-decade. Sac (or Sack) dresses became common; these were loose and baggy. 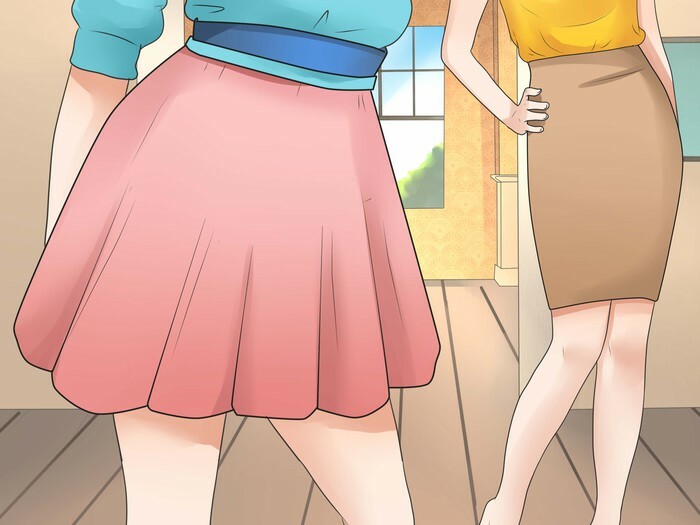 At this time, the hemline for most skirts and dresses was near the knee. Jackets became boxy and the Chanel look (a type of woman's suit) was worn. This look had contrast trim around the jacket edges, no collar, and small pockets with contrast buttons. Get the right type of pants/trousers. There were several different styles of pants popular for women in the 1950s. Pant legs became narrow during the '50s. Pants were very popular and worn at home and for leisure. The capri was mid-calf length; the peddle pusher was a long short; Bermuda shorts were knee-length. These were worn with flat shoes, ballet-type flats, and simple sneakers (like Keds). Socks were optional. 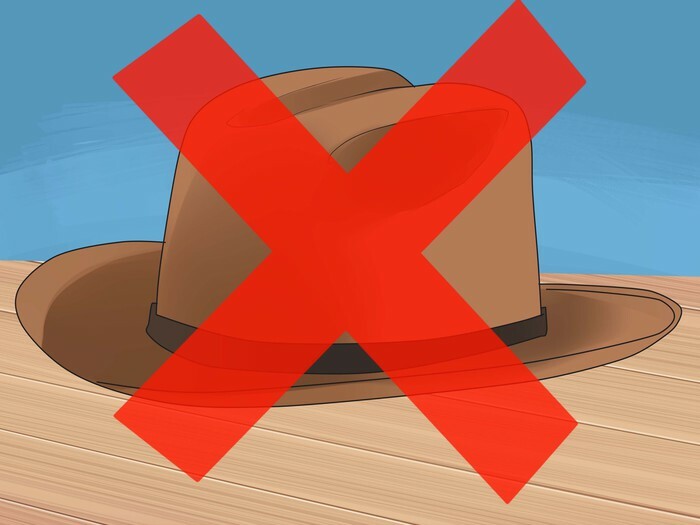 Wear a hat! 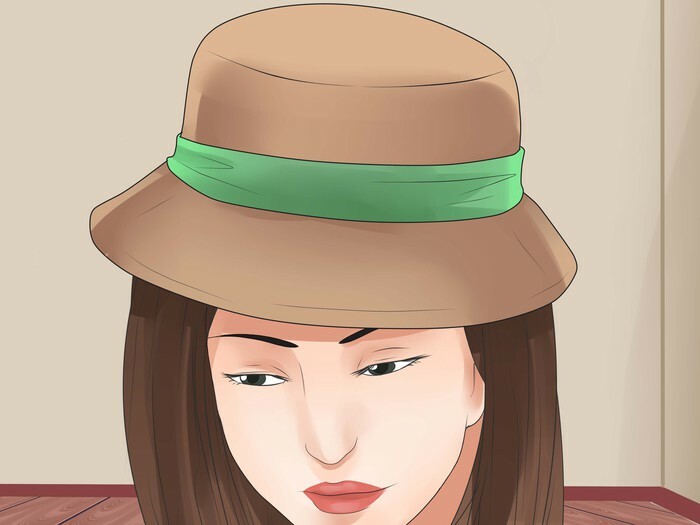 Small hats worn close to the head were popular during the early 1950s, but during the latter years flower pot hats were seen. These kinds of hats were worn higher on the head and were bigger in shape. Know the hairstyles for women. Early in the '50s hairstyles were short and close, much like Audrey Hepburn's style, with short bangs in the front and short, flat layers on the sides and back. Later, women's hairstyles became larger and bouffant, in the fashion of Elizabeth Taylor. 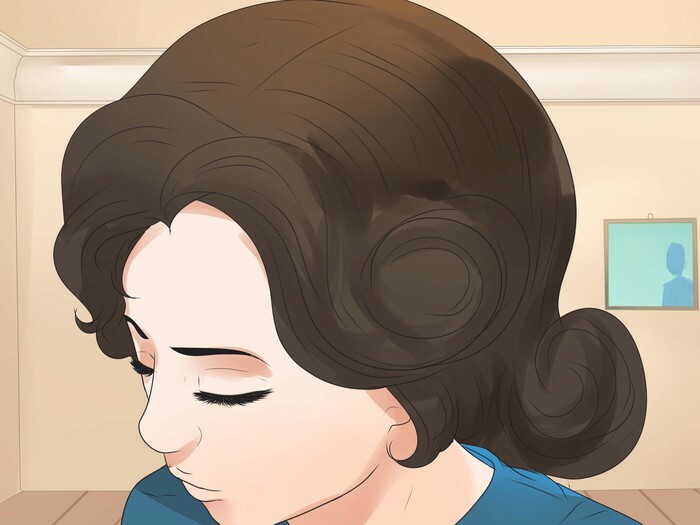 This style was often worn shoulder-length with buoyant roll curls in the front that continue into the sides of the hair in the wavy pageboy style. Invest in some period appropriate shoes and gloves. Gloves of all colors were worn with dresses. 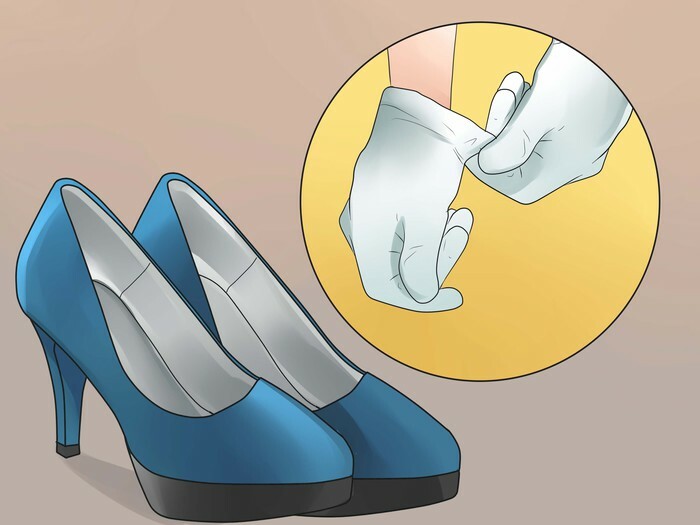 Longer (above the elbow) gloves were worn at night with bracelets for a more formal look, while shorter (wrist length) gloves were worn in the daytime. Shoes often had pointed toes and thin kitten heels. Carry a handbag. 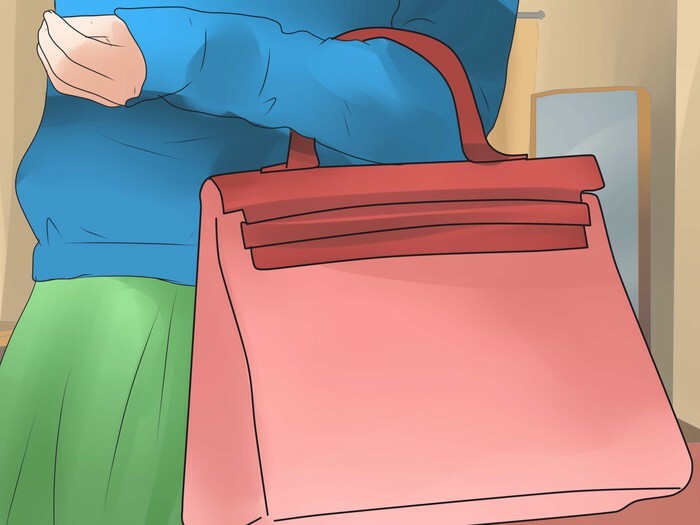 In the 1950s, handbags grew smaller, often envelope in shape. The "Kelley" bag was a simple hand bag with handle. Wicker and gold lame were popular handbag material. Most handbags had shorter handles (no long straps). Wear a fitted suit. During this time, suits were becoming more narrow - with slim "cigarette leg" pants and a sack coat shape (like a Brooks Brother's suit). Charcoal grey was a popular color for men's suits. 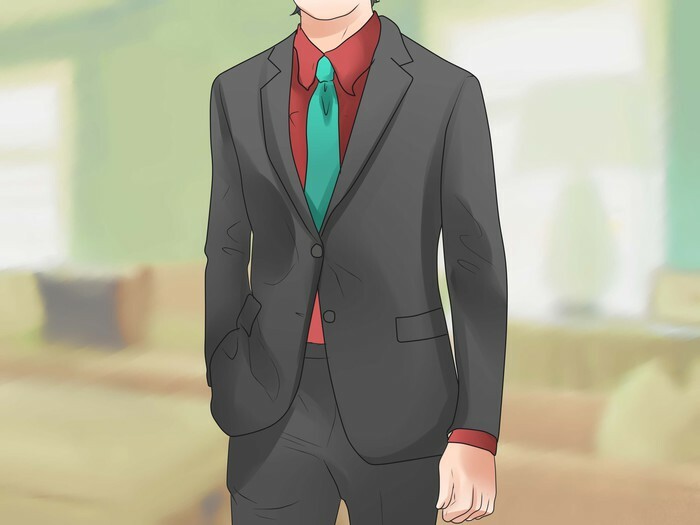 Note: a white shirt was usually worn with this grey suit, along with a plain, narrow tie. Ditch the hat. Before the war, all men wore hats. But moving into the '50s, hats became less and less popular. Why? Because men were driving more and hats were bothersome to wear while in the car. Pay attention to the trends for shirts. For men, there were many situational fashions that were worn at certain times by certain types of people. Khaki and plaid shirts or button-down collared oxford cloth shirts were seen on students. T-shirts were seldom worn alone because they were considered an undershirt. Hawaiian shirts and box shirts were worn in the summer. 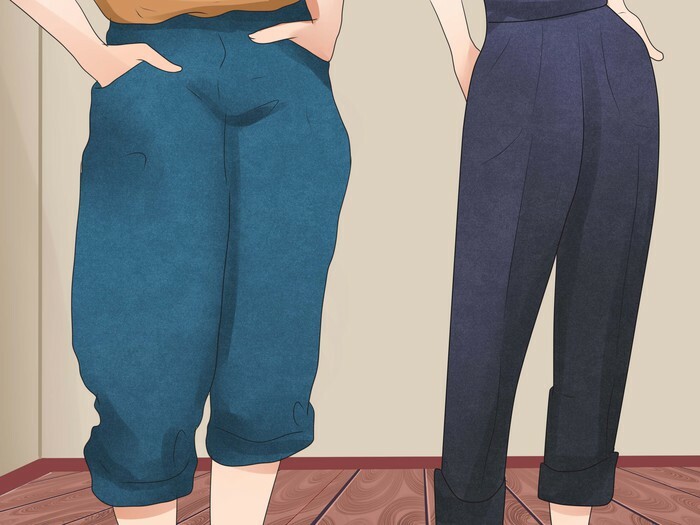 Know what pants were in fashion. 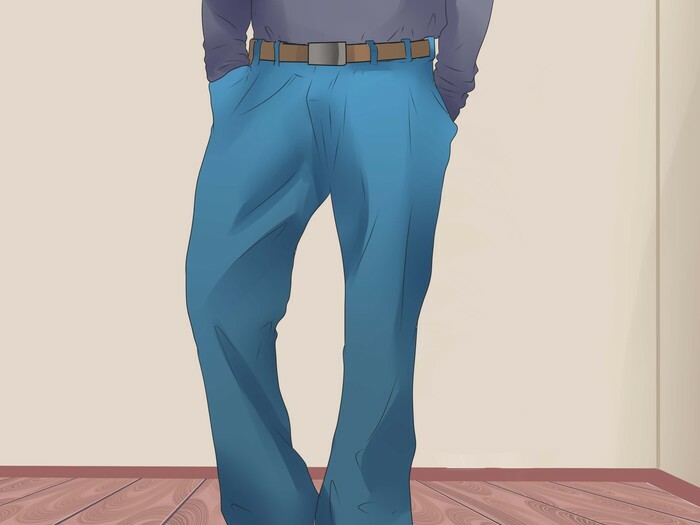 Slim-legged cigarette pants were a popular men's style during this time period. Jeans were typically used for outdoor wear, but many teenagers wore them more regularly. Bermuda shorts were often worn in the summer. Find the right shoes. In the 1950s, most men wore Oxford shoes (often two-toned), saddle shoes, or chukka boots. Saddle shoes are two toned (usually black and white) leather shoes with a flat heel. They are typically a white shoe with a black decorative "saddle" in the middle section. 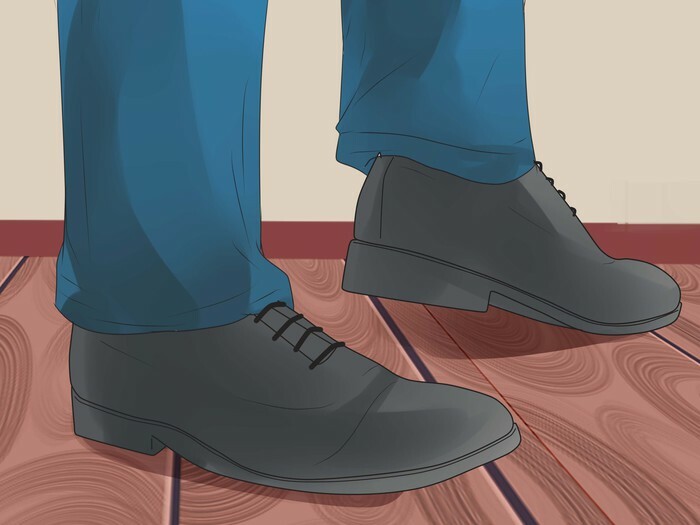 Chukka boots are ankle-high leather boots that typically only have 2-3 pairs of holes for lacing the shoelace. Know the hairstyles for men. 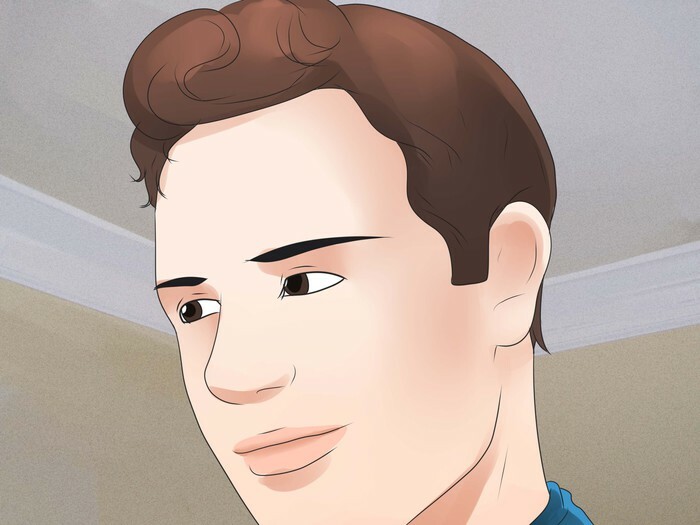 Hair was worn short, in a post-military style. 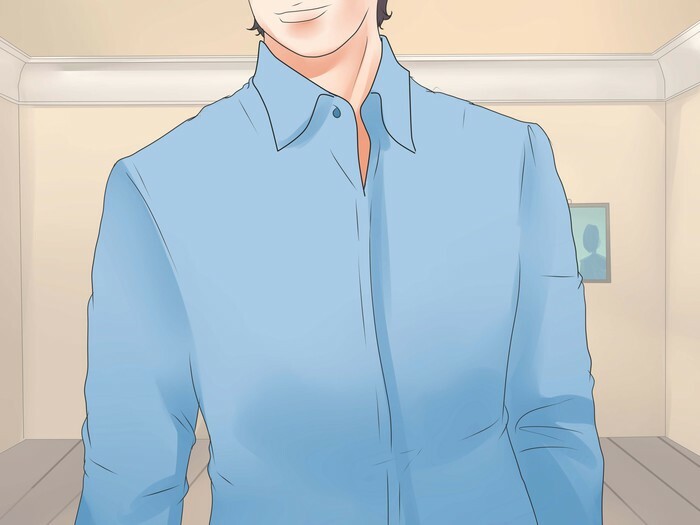 Men started to wear their hair longer at the end of the decade, but it was still groomed to stay off the ears. Some men also went for the longer, greased pompadour. Elvis Presley made this hairstyle famous in the 1950s. 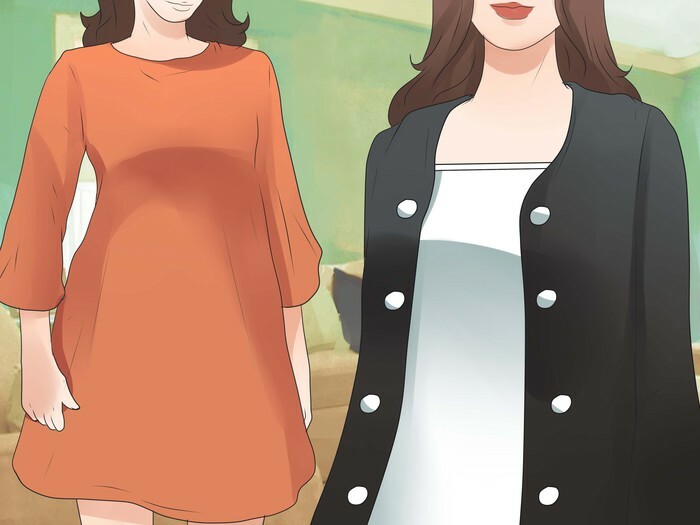 Sewing patterns: these are excellent for fashion looks, and include all accessories that were worn with an outfit. Even hairstyles are shown. Use hair spray to get the look of a "big hair" style; this will make it stand out . Research: look for Vogue, Bazaar, Ladies Home Journal, and McCall's Magazine at your library. Weekly magazines such as Life and Look are also good for fashion ideas, especially men's wear. Wear a "waist cincher" corset or girdle to get a smaller waistline.